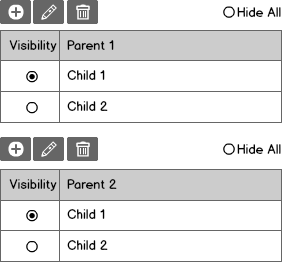 I believe being only to view at most one child from either tables calls for radio buttons, but since "turning off" radio buttons is not possible, what's the best way to allow the user to hide the child from either/both categories? My best idea was to include a "hide all" radio button on top of each table. Any ideas? Or is this the right approach? Note: The add, edit, and delete buttons are on the top left of each table because, in the rest of the app, that's where the buttons are. The dropdown gives an affordance that only one value can be selected and would not cause confusion. Right now your radio buttons dont look like a radio group and users might get confused about why they cant select both options. I can't comment yet, so I have to make this an answer. I am confused with the use of the radio buttons - but mostly because I can't see the context in which this screen in used. Can you explain what this screen does or wants to achieve - something along those lines. Maybe provide a bit more context? "Hiding" the child may not be the best solution, as it may not be apparent to the user that the act of hiding is setting that option to "no child". They may interpret it as just hiding the option from view. Best option would be to include a third child option, which would be to set the option to "none". You're then displaying the option to "hide" in a place closer to the other options, making the ability to "hide" more obvious that in the wireframe posed with your question. You'd also be using the radio button design pattern as it's intended to be used - i.e. user can select one and only one option. Having it as the top option also ensures it's always in a consistent place for the user. Not the answer you're looking for? Browse other questions tagged tables radio-buttons or ask your own question. Should I use Drop downs instead of radio buttons? Alternatives to 18 options in a radio group? 5-6 choices: Radio button or drop down? Should parent toggles control child toggles?